Marisa Viggiano advances the ball up the field. After Sunday’s 2-1 loss at Maryland, her and coach Michael Moynihan were perplexed about how the team had lost two matches in a row. After Sunday’s 2-1 loss at Maryland, coach Michael Moynihan and senior midfielder Marisa Viggiano could not even believe they were having this conversation. How — for the second year in a row — had Northwestern lost to one of the worst teams in the Big Ten, and put its nearly-secured qualification for the postseason in jeopardy? Moynihan and Viggiano spent a good deal of time after the game Sunday just trying to make sense of how the No. 14 Wildcats (8-4-2, 2-4-1 Big Ten) lost Thursday to Rutgers and again Sunday at Maryland. After losing 1-0 at Illinois at the same point in the year last season and dropping to seventh place, goalkeeper Lauren Clem brought the team together and privately criticized its lack of intensity and poor execution. She scheduled extra conditioning, video sessions and scouting, desperate to find a way out of this slump and back into the postseason. The Cats responded by winning six straight games and advancing to the second round of the NCAA Tournament. This season, Moynihan thinks that extra anxiety is not necessary even after losing to the Terrapins (4-7-4, 2-4-1), the team with the third-worst record in the Big Ten. Moynihan said unlike during their losing streak last season, the Cats have outplayed their opponents in every aspect. Sixteen minutes into the game, Maryland shocked NU when forward Jarena Harmon received a pass at the top of the goal box and without hesitating, turned and fired a shot over the arms of freshman goalkeeper Mackenzie Wood. Eighteen minutes later, midfielder Loren Sefcik dribbled down the right wing and, with an extremely narrow angle at the goal, nailed the far left side of the net for the second goal of the game. Moynihan said he had “no idea” how the Terrapins were able to execute as well as they did on their two chances. At halftime, down 2-0, Moynihan said he wasn’t concerned about how the last 45 minutes played out and made just one minor adjustment, switching to a 3-5-2 scheme to better control possession in the midfield. 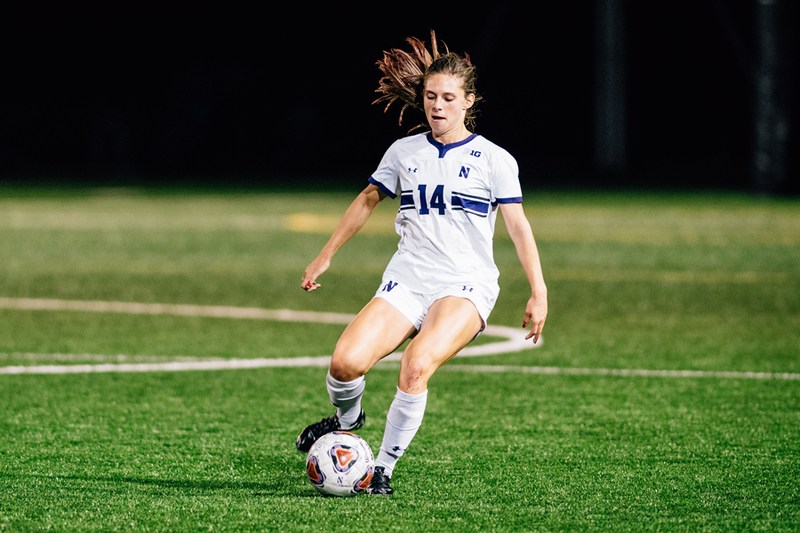 Senior forward Brenna Lovera scored in the 53rd minute, heading Viggiano’s uncontested cross from the left corner past Maryland goalkeeper Rachel Egyed, and NU outshot the Terrapins 21-8 in the game. But the Cats could not level the score, even though Maryland did not have a single meaningful chance to extend their lead in the second half. It was a similar story as Thursday’s loss, where NU outshot Rutgers 20-8 and controlled possession for the majority of the game but lost 1-0 in overtime. Currently sitting in 10th place, the Cats have four games remaining before the conference tournament to improve their standing. Only the top eight qualify teams in the conference, but NU’s four remaining games are against opponents projected at the beginning of the season to finish in the bottom half of the conference. After Sunday’s loss, Lovera responded like a player who’s been in more difficult and nerve-racking situations than NU finds itself in currently.